Beryl was given to GAP by her trainers Pam and Denis Schofield (who were Louie's trainers too!) and she is just the coolest dog! 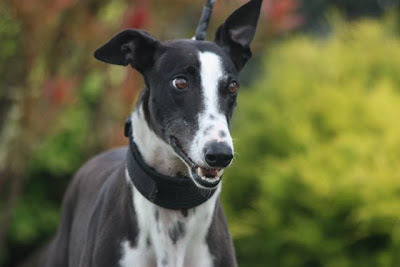 Now, Beryl has joined our greyhound group in Feilding (Frankie counts too -he is an honorary greyhound)! Sue also says: Beryl came to live with us on 5th April and is settling in well. Frankie loves her but sometimes he thinks she's a bit bossy:-) He's not used to being told what he shouldn't do but he takes it well. Beryl thinks Frankie is pretty darn cool, and she's got someone to boss around now! She is gradually getting used to being a pet and enjoying it. And we're loving having her in the team.